Select rolls and supports can be imprinted with your company name, logo and/or slogan in your choice of color. Printing can be placed on the side and/or front of the support. Requires minimum order of 50 pieces. FREE CUSTOM PRINTING with order of 400 or more pieces. Free printing is single-color, single-panel. Call 800.367.7393 for more details or to order. 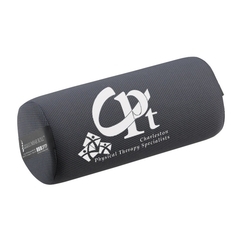 "Having Charleston Physical Therapy's name on the lumbar rolls is a great way to enhance our name recognition to the public and the healthcare community. These rolls are great gifts and great educational tools when attempting to make an impact."